Andre Canniere is an American-raised, London-based trumpeter and composer whose recent project The Darkening Blue has seen him explore the relationship between words and music. Leah Williams talks to Andre about poetry, getting stuck into song composition, and the project’s new material, which can be heard in Birmingham, Derby and Luton before coming to London at the Vortex Jazz Club on 31 October. 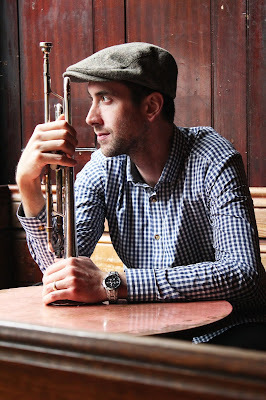 LondonJazz News: Where did your musical journey begin? Andre Canniere: I come from a very musical and creative family so it was always around and I started learning the piano from my dad at a really young age. My love of the trumpet came somewhat by chance though. My parents had this old beat-up cornet hanging on our music room wall and one day I just took it down and began to teach myself. When I showed my teacher what I’d managed to learn he suggested I start taking trumpet lessons and everything really began from there. LJN: You’re from the States originally, and spent time living and working in New York before coming to London. What are the major differences you’ve found between the music scenes in the two cities? AC: Well, I’ve been in London for over ten years now so I’m sure a lot has changed back in the States but when I first came here the main thing I found challenging was the sprawling nature of London. New York is built up rather than built out and so it feels like there’s easier access to the music community. A common night there would be to play a gig then pack up and walk round the corner to another one. In London, I’ve found it can sometimes be a bit easier to feel disconnected, especially if you don’t live in the main jazz hubs around east London. But over the time I’ve been here, the London scene has been so exciting to be a part of too. It’s become so much bigger, more diverse and forward-thinking with loads of incredibly talented musicians making their mark, not just in the UK but internationally too. LJN: Your most recent project, The Darkening Blue, comprises of a sextet and features original instrumental and vocal music. What inspires you to compose? AC: I’ve always liked writing. When I was studying my undergrad in general music performance, I was playing and composing a lot of classical music and as I moved more into jazz, I think the natural curiosity and creativity of the genre has only further inspired me to write. LJN: Do you think your classical roots have influenced your jazz writing? AC: Undoubtedly. Having spent so much time studying scores and learning all the rules to composition, they’re tools or techniques that I always have in my head. But rules can also easily be broken and that’s what I love so much about writing jazz! LJN: The first album from The Darkening Blue project was inspired by the poetry of Rainer Maria Rilke and Charles Bukowski. Where did the idea for this come from? AC: I’ve always been interested by the relationship between words and music. Whether it’s through a song setting or simply using words as an inspiration for communicating through instrumental music. I can’t claim to know much about poetry, but I’ve loved Bukowski’s novel writing for a long time and I was blown away when I started delving into his poems. LJN: Why did you decide to use other people’s words? AC: I have so much respect for lyricists. Every time I try to write my own text, I hate it! It either sounds too simple or too pretentious; I just can’t seem to get it right. So using existing words written by the masters seemed like the way to go. LJN: How have you found the process of writing songs? AC: It’s really stretched me as a composer. When you’re writing instrumental music, there’s little restriction on melody and even then you can always find ways to push past those boundaries. When you’re writing for a singer, there are so many other things to think about, such as phrasing, range, where to pause, which parts of the text to highlight, etc. I’ve really enjoyed the whole process though and feel like each time it’s coming more and more naturally. It’s helped push me to find new ways of writing, which is really important to me. I always want to keep my sound moving forwards. LJN: You’ve already written quite a bit of new music for this project – what can people expect to hear from the next album? AC: For this new music, I’ve worked with two UK-based, living writers: Malika Booker and Rebecca Lynch. This in itself has made composing a totally different experience. I’m setting some of Malika’s existing poems to music and she gave me so much freedom to do what I wanted within that, which has been great. With Rebecca, it’s been more of a collaborative process, working with a lyricist to create something together. Buy the first album from Andre Canniere’s The Darkening Blue project (Whirlwind Recordings) at: Whirlwind Recordings The Darkening Blue line-up is made up of composer/trumpeter Andre Canniere, saxophonist Tori Freestone, pianist Rick Simpson, bassist Tom Farmer and drummer Andrew Bain, and features vocalist Brigitte Beraha.